* Now available WITHOUT A TANK for our customers in the European Union, Australia, New Zealand, or Japan due to tank regulations or if you simply already have your own tank. FOR A LIMITED TIME TAKE ADVANTAGE OF OUR INTRODUCTORY PRICING AND *FREE SHIPPING! The EasyDive Kit is a complete minimalist dive & snorkel system. Just grab and you are ready for your next water adventure. 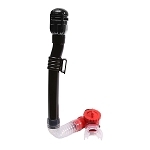 The kit incorporates the New Snorkelator - a patented technology that offers divers the ability to combine their snorkel with any diving regulator. 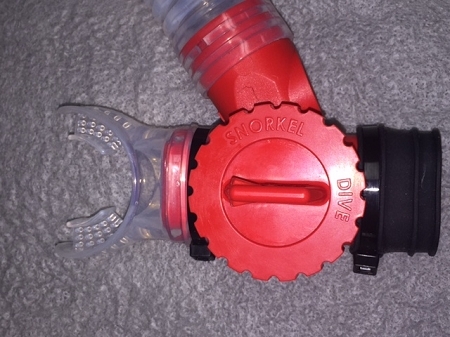 Switch from snorkel to regulator with the turn of the dial and just one mouthpiece! No longer limited to the surface and quick underwater swims, snorkelers can take occasional deeper dives to explore the shallows, with less equipment than a full diver would require. Unique Tank Valve/First Stage Regulator Combo - smallest footprint and lightest weight in the world! Optional add-on: Regulator Necklace for $12.00, keeps the regulator mouthpiece close-by. Made from black silicone, circumference is 28". 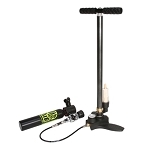 Portable Air Compressors also available on shopping cart. 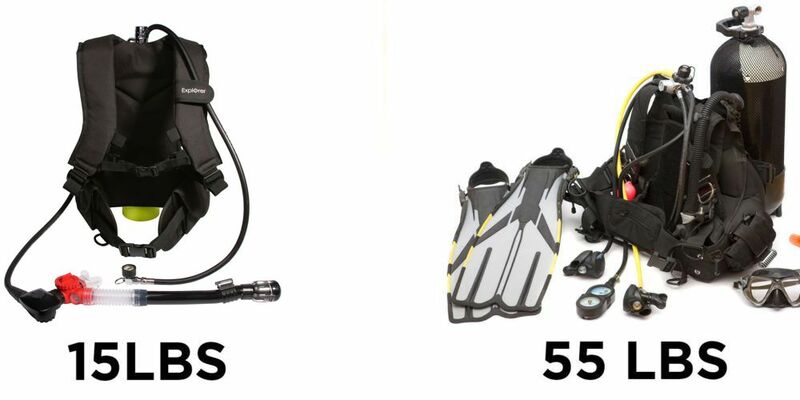 Why purchase a standard scuba package that weighs over 50 lbs, and costs over $1000, when you can get the EasyDive kit for only 15 lbs and $575 ($475 without Tank)! 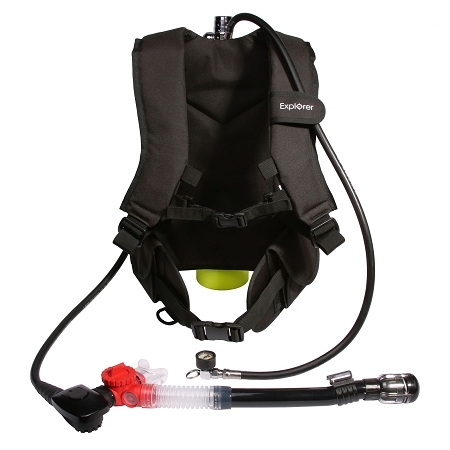 The EasyDive kit is 1/3 the weight, and about 1/2 the cost of a standard set-up! *underwater hunting - whether its for scallops, lobsters or urchins the EasyDive kit is perfect! 1. How do I get my EasyDive filled? Take the EasyDive along with the included refill adapter to any dive shop and they will fill it for you for a nominal fee. 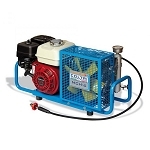 Dive shops have high pressure air compressors that pump clean breathing air. 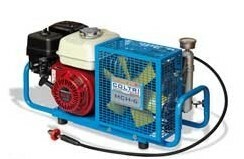 We also sell a small, portable Air Compressor (p/n: 3100-COM) that can be purchased separately. EasyDive comes with a DOT/TC marked cylinder and is not for use in EU countries. 2. Can I fill my EasyDive off a compressor purchased at a hardware store? No, EasyDive has a 3000 psi tank, but those small compressors sold at hardware stores only pump about 125 psi. Plus, those compressors do not filter the air so it is not breathing quality air. 3. Can I travel on a commercial airline with EasyDive? TSA regulations state that a tank valve must be removed from the cylinder, which in the case of EasyDive is professionally attached. Therefore, it would take a professional to remove and reassemble it. For that reason we do not recommend flying with your EasyDive system. An alternative is to ship it (must be empty) to your vacation destination prior to your trip and then get the EasyDive filled at your destination. 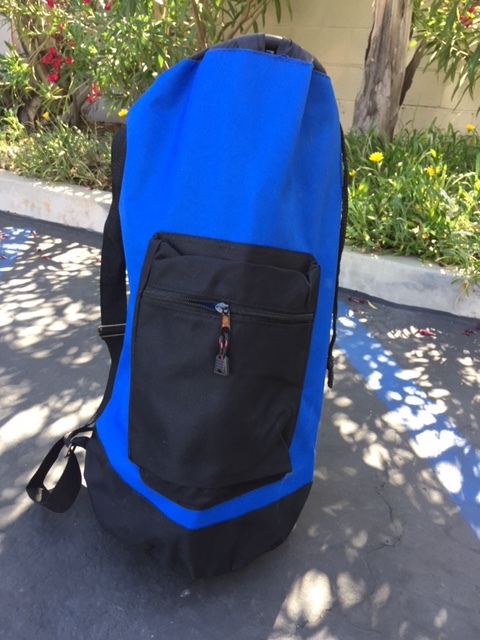 If you want to travel with a small air system, check out the Spare Air at www.spareair.com which can be easily disassembled and taken on airlines. 4. What maintenance does EasyDive need? Just like all scuba equipment, they must be rinsed thoroughly after each dive to remove salt water and sand. 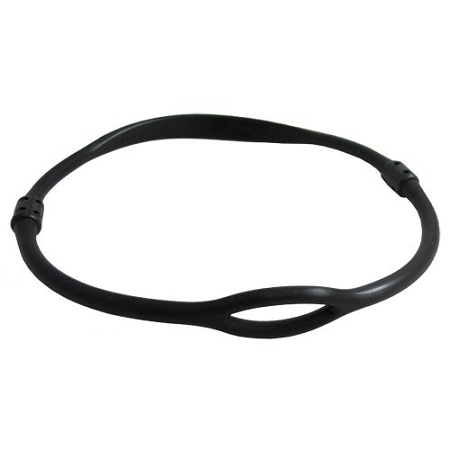 Store EasyDive with a minimal amount of air in the cylinder. 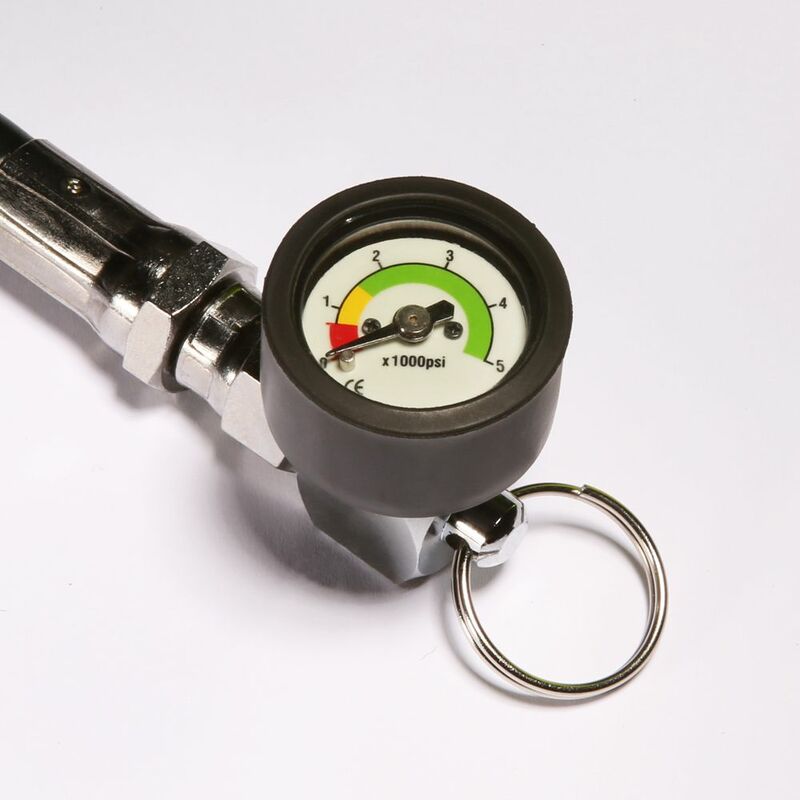 Every year or so the regulator should be serviced by your local dive store, and every 5 years the cylinder will need a professional test called hydro-testing done by a dive store. 5. Can I buy an extra cylinder? 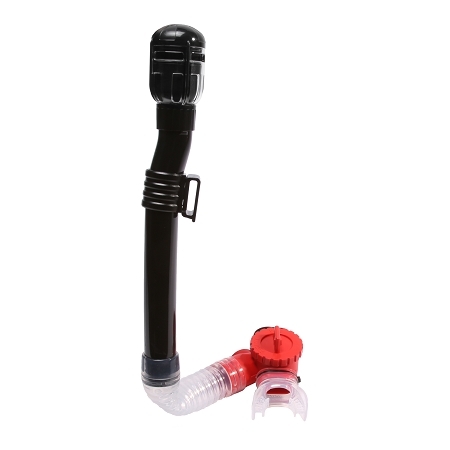 The way EasyDive is designed it integrates the tank valve and 1st stage of the scuba regulator into a very small and lightweight footprint, this is unlike standard scuba set-ups. This means that you cannot simply swap out the cylinder with another full cylinder. Depending on interest, we may come out with a model where you could do this but we anticipate it adding 2 lbs to the system weight and about $150 to the cost. 6. Do I need to be a certified diver to use EasyDive? Yes, users should be scuba certified to understand the proper procedures and understand the risks when using scuba equipment. *Domestic addresses will have a $5.00 handling fee added (listed as shipping charge, regular shipping is free), international shipping is additional.